Once mounted on the bar at the Planets leisure complex in Woking, XX895, a Gulf veteran as you can see, has had happier times. The fin was cut off to clear the roof, the undercarriage doors and pitot were removed and it was adorned with various drinks advertisements. While it had survived the smoky atmosphere of a bar, sadly the place changed hands and the new owners had the aircraft removed - in pieces. 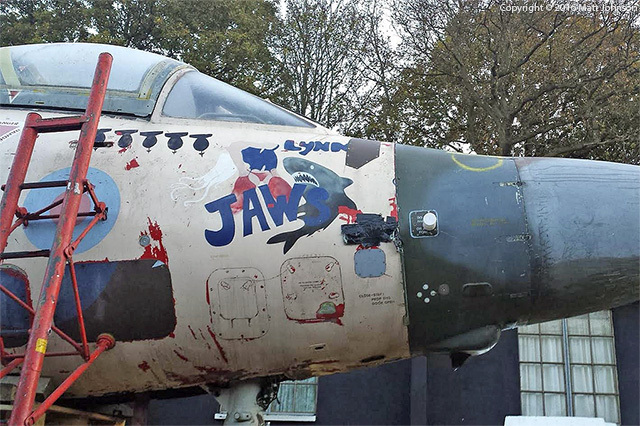 The new owner used what remained of the airframe (which was tail-less to fit into the bar) for spares for another aircraft and then scrapped most of it, keeping only the nose. She was stored (I think that's the kind description) near Bicester then at Fenny Compton until Matt acquired her in 2013 and moved her to Thorpe Camp in December 2015. Since arrival at Thorpe Camp Matt has wasted no time in getting 895 back to her correct height with the nose wheel now fully extended. A replacement nose cone, intermediate nose section and canopy have also been fitted. Although Matt has her original canopy it unfortunately has been too badly damaged to use. The whereabouts of 895's original nose cone and intermediate sections are known but are sadly unobtainable for the restoration so for the time being at least she looks a bit of a patchwork quilt using the spares that have been obtained! Matt plans a rebuild of the interior over the coming months starting with the observer's cockpit. The long term aim is to have both engine intakes and engines panels refitted making 895 possibly the biggest Buccaneer cockpit section at almost 30ft long!